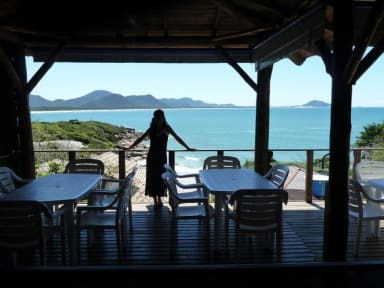 Barra Beach Club Oceanfront Hostel i Florianopolis, Brasilien : Boka nu! Amazing hostel, amazing staff and amazing location! Go there if in Florianópolis!! This is the best Hostel in Florianopolis. The owner Jim is a champ that wants the best for you! The food at the restaurant. My god! 10/10 for being a hostel. Could be more vegetarian options. And the staff is the best! Especially the two Japanese brothers! Had a lot of great laughs together. Even got the special home made chilisous! Wi-Fi is s*** if you're not close to the restaurant and the front gate is always open and small. Thanks!